DUG Insight User ManualFrequently Asked QuestionsFrequently Asked Questions MiscellaneousI have a great idea for Insight! How do I send DUG my suggestions? If you have an awesome idea that would revolutionize Insight, or know of a feature that would drastically improve Insight's functionality, we would like to hear from you! Please, tell us all about it! Zoom: Please, tell us all about it! In Insight's Control Panel, go to the Help menu. Click Send Feedback/Ideas. This will open the online feedback form in your default browser. In the online feedback form, type your suggestion or queries in the Comments box. 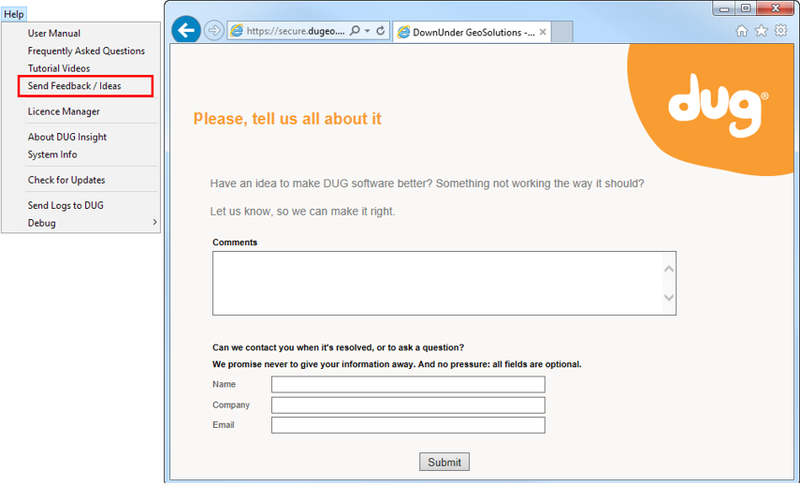 Type your Name, Company and Email for DUG to contact you. These are optional fields. Prev: Where can I find the manual for older versions of the software (e.g. Insight 3.1)?